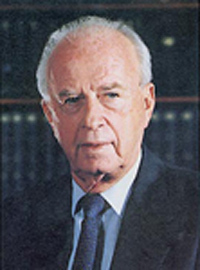 On November 4, 1995, Yitzhak Rabin the Prime Minister of Israel, was assassinated by a Jewish assailant. The man who had led Israel in the greatest battlefield triumph in the history of Israel; the 1967 Six Day War, paid the ultimate price, as a casualty in the battle for peace. A one-of-a-kind television documentary was produced, which tells the story of Yitzhak Rabin. Through painstaking research of film archives in Israel and abroad, comes the story of one man’s endeavor for conciliation and peace. This is the story of the decades-long struggle between Jews and Arabs, which also reflects the story of the State of Israel in the 20th century. However, the story of Yitzhak Rabin is not only the story of a military man who became a soldier in the army of peace. It is also the story of the fifty year political struggle between Rabin and Shimon Peres, representatives of two different political cultures. Both recipients of the Nobel Peace Prize, yet bitterly opposed to each other, it is a riveting account of how they ultimately unite in a common cause during events that profoundly affect the life of the State of Israel. In this documentary Shimon Peres, Dahlia Rabin, (Rabin's daughter), and many others, give their candid accounts along with rare and emotionally charged archival footage. Most of this material is seen here for the first time. Included is footage taken by Yitzhak Rabin, family videos in the Prime Minister’s aircraft, and rare behind the scenes at the Nobel Peace Prize ceremony. The War on Terror, the Six Day War, the armed struggle which followed the UN partition of Palestine, the Entebbe rescue operation, the Peace Accords, extremist Islamic terror in Israel, dilemmas surrounding the issue of occupation, the emotional speeches made by Yitzhak Rabin, and the world shocked by his murder at the close of a Tel-Aviv peace rally are all explored as we approach the10 year anniversary of Rabin’s assassination. These chapters in the biography of Yitzhak Rabin, are much more than just one man’s life story.